Fall is finally here with cooler temps, and that means making meatloaf, among other things. Meatloaf has always been comfort food for me. One of the best things that my Mom made was meatloaf. (I was a picky eater as a kid). Believe it or not, the first thing that my hubby and I had an argument about was how we made meatloaf. He made his meatloaf with bread and milk, and I had always made mine with tomato sauce and oatmeal, along with the ground meat, egg, and spices.How do you make your meatloaf? I made the meatloaf pictured above, which is low sodium and low fat. Over the years, I have modified my recipe to be healthier. I used ground turkey, egg, low sodium tomato sauce, oatmeal, and chopped onion. Then, I wanted to add a layer of chopped mushrooms, and fresh spinach. My hubby grew up eating spinach from a can, so he never wanted fresh cooked spinach, Now, he's converting to a fresh spinach lover, Yay! I also used fresh basil and oregano from our waning herb garden. The herbs, spinach and mushrooms add so much flavor and color, and I added no salt. 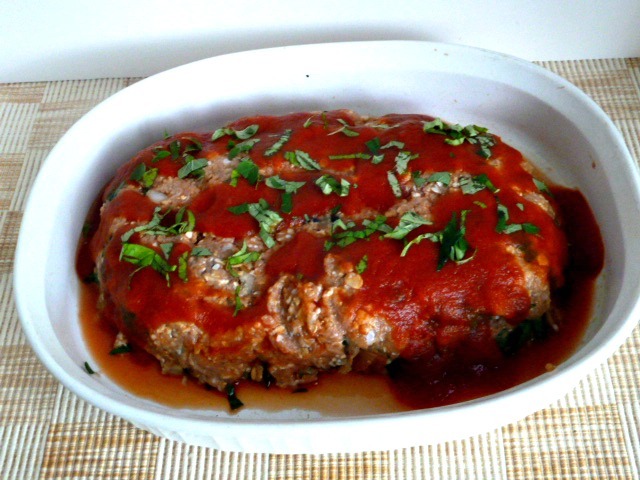 I accidentally didn't add all of the tomato sauce to the ground turkey mix, so I just poured the rest of the can over the top of the meatloaf, before I baked it, and sprinkled with the fresh herbs, We love this meatloaf which makes a wonderful dinner with sweet potatoes and a salad. My hubby takes meatloaf sandwiches for lunch, but have I have never liked meatloaf sandwiches. My meatloaf has to be warm. 1. Combine ground turkey egg and onion in large bowl, and 1 tbsp of basil and oregano, and mix until well combined. 3. Stir in oatmeal until desired consistency. 4. Pat half of meatloaf mixture into a 9 x 5 baking pan**, sprayed with cooking spray. 5. Add the layer chopped mushrooms to meatloaf in pan. 6. Layer chopped spinach on top of mushrooms. 7. Pat remaining meatloaf mix over the spinach and pour remaining tomato sauce over the top of the meatloaf. 8. Garnish the top of meatloaf with the rest of the fresh herbs. 9. Bake in 350 oven for 1 hour-1 hr 15 min, 165 degrees on the meat thermometer or until juices are clear. 10. Cool on rack for 10 min, before serving, Enjoy! I like to bake my meatloaf, free form, in a pan larger than the meatloaf, so the juices and fat, if any, flow away from the meatloaf. I packed the meatloaf mix in a 9x5 pan sprayed with cooking spray, then removed it from the baking pan to the casserole dish. 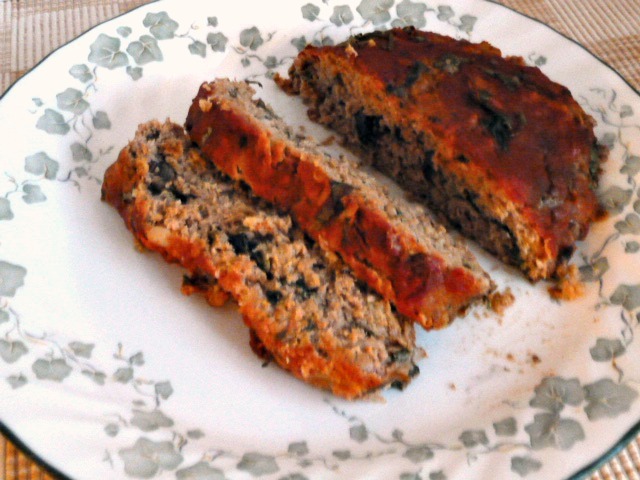 This is the healthier" version of meatloaf, which is very with herbs and veggie stuffing. You would like it. So the chill has hit Chicago now? I'm still sending Dudette to school in shorts; can you believe it? I didn't like meatloaf when I was a kid but it's definitely become a cold-weather comfort food for me now. I love the modifications you've made, not just to make this healthier, but all the added flavor as well. We have had temps in the low 70's, during the day, and 40's-50 at night. Perfect weather as far as I'm concerned, and perfect for meatloaf, too. Meatloaf stuffed or not, is just good, and comforting. Hi Becky! This looks delicious...and I love how healthy it is! Thank you for sharing your meal with me! I've been baking all day, and I'm eager for sleep, but I'll now be dreaming delicious dreams thanks to you! I hope you have a wonderful Monday. Check out WWW.CHEFSILVA.COM we have a perfect alternative to buying fresh herbs that many times go to waste in your refrigerator! I wish the chill would make it's way over here, it's been high 90's the last couple of days. My husband is a huge meatloaf (or is that hot dog?) dude, I've never tried it with the oatmeal, only the bread. Learn something new everyday, huh.